Wear the iconic yellow and blue of the Sweden national football team with a replica version of the Swedish shirt, shorts and socks. Keep up to date with your nation’s latest kit here at Soccer Box, your number one stop for official football merchandise and accessories. We pride ourselves on being supplied directly from the Adidas distribution centre, ensuring we guarantee 100% official stock for our worldwide customers. Whether it’s the World Cup, Euro’s or simply a friendly, then cheer on your nation with the latest Sweden home shirt. We also stock junior and adult sizes in the jersey shorts and socks, so show your pride in the Swedish squad and order while supplies last. 2013 saw the Sweden national football team undergo a huge change. The friendly fixture Sweden vs Argentina back in 2013 was a dream game for Swedish fans, the big day also saw the debut Sweden kit from new sponsor and manufacturer Adidas, a role that they had take over from rivals, and long-term suppliers of the Sweden jersey Umbro. The Nordic managing director of Adidas said ‘this is the biggest symbol you can have in Sweden and we want to be associated as market leader here in football with the biggest symbol’. The 5-year deal was secured back in 2013, guaranteeing us that we will be seeing the Sweden football kit featuring the Adidas logo up until at least 2018. Sign-up to our newsletter for alerts of new kit releases and information should the Swedish football association opt for new supplier. For each campaign including the European Championships Adidas designs, manufacture and releases a range of merchandise for the national team, including the Sweden home kit, away kit and training wear for adults, women and children of all ages! The release of replica wear ensures that avid fans of the Swedish team can mirror the look of their beloved squad! Although yet to be crowned champions in a major tournament Sweden have still had great success in their World Cup and Euro runs. The greatest success happened when the nation played host, as the sea of yellow and blue Sweden jerseys emerged from the stands, as well as the roar that echoed around the stadiums by the team’s loyal fans. With thanks to the huge support of the home crowd Sweden did in fact achieve a second-place spot in the World Cup in 1958, as well as reaching the semi-finals in the European champions in 1992! The Sweden home shirt is a popular hit especially when major campaigns are up and coming! 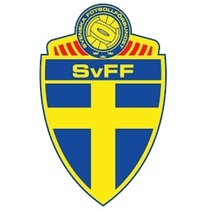 The yellow and blue colour scheme of the home football kit originates from the Swedish flag, which is blue with a golden-yellow Scandinavian cross and has been the colour of the home shirt since foundation. The colours are derived from the Swedish national arms and the design is from the Danish flag, allowing you to showcase your support distinctively to the Sweden national football team by wearing a replica home shirt, kids or adults are available here at Soccer Box and pay homage to the impressive team and individual performances. The current 2018 Sweden home jersey features subtle angled stripes and are influenced by the shirts the Swedes took to Italy in 1990. After taking over long-term suppliers Umbro, Adidas has done an outstanding job in the production of recent kits during their 5-year deal, but will the Swedish 2018 home shirt be the last one we see with the Adidas logo? Still yet to be announced, Adidas and the Sweden Football Association are yet to confirm any kit deals. One of the best players in the world wears the Sweden football shirt, and goes by the name of Zlatan Ibrahimović and his unique style of play and confidence certainly got Sweden recognised as a footballing nation. Quite easily the top-goal scorer for his nation Ibrahimović has also played under the names of Juventus, Manchester United, Barcelona, Inter Milan and now currently playing at LA Galaxy. Owning an item of Sweden merchandise is a superb method of displaying love and support to not only your nation but also this outstanding player who holds so many records. Most capped player of the Sweden national team is Anders Svensson, a midfielder who appeared 148 times for his Swedish team and many of those times he was captain. Surpassing Thomas Ravelli’s previous record of 143 caps, Svensson then retired from international football in 2013, with a huge 148 international caps under his belt! Looking to display your support to your beloved nation as well as your favourite players then look no further. Here at Soccer Box we pride ourselves on offering authentic merchandise supplied directly from the official kit suppliers Adidas, ensuring we are stocking 100% official merchandise that is available for you to order online. Our goods are available in a range of kids and adult sizing with the Sweden home kit, away kit and training wear available here for the Swedish fans. Simply very passionate about the Sweden football association or have a young budding fan on your hands then no matter what time of the year, whether before or after a huge soccer tournament we try to stock our kits all year round. Contemplating on ordering here at the home of football merchandise, Soccer Box? Then be sure to call or customer service team, on hand to answer your calls, ready with the correct information to give all the reassurance you need when placing your order for a Sweden football shirt online or over the phone!